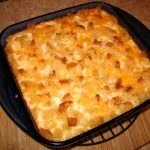 Well, winter is here and it's time for some comfort food and mine happens to be Baked Macaroni & Cheese. Here's a recipe that has been around our house for years....enjoy! Make macaroni - Bring the 6 cups of salted water to a boil. Add the macaroni and cook till almost done, about 9 minutes. Drain in a large bowl. In a large saucepan over medium-low heat, melt the butter and whisk in the flour. When smooth, whisk in the milk and stir in the onion and paprika. Simmer gently, stirring often for 15 minutes. Remove from the heat and stir in two-thirds of the cheese. Season with salt and pepper to taste. Stir in the macaroni. Pour half of the mixture into the baking dish and sprinkle with half of the remaining cheese. Top with the remaining macaroni and then the remaining cheese. Melt in a small skillet the tablespoon of butter and add to the bread crumbs, mix till all the bread crumbs are soaked with the butter and sprinkle over the top of the macaroni. Preheat the oven to 350 F. degrees. Bake until the breadcrumbs are browned, about 30 minutes. Let stand 5-10 minutes before serving.